If you are travelling from a country that is not in the EU, you cannot bring animal products for personal consumption (meat, meat products, milk, dairy products) into the European Union. If you are coming from the Faroe Islands, Greenland or Iceland, you can bring in small amounts of meat and dairy products for personal consumption. Other foods may be brought into Spain up to a maximum weight of one kilo. Personal luggage: you can carry articles for personal or family use, or those intended to be given as gifts, unless they are considered commercial merchandise due to their amount or nature. We recommend that you ask the airline about the conditions and restrictions before you travel. Cash: generally you may only bring up to €6,000 into Spain in cash and higher amounts must be declared. Ask the airline directly about the conditions and restrictions. Here are some general tips and information to keep in mind when planning your trip. Remember that these are merely indicative and that the weather can vary from year to year. In recent years particularly there have been some fluctuations. Autumn: light, slightly warmer clothing will be needed. Winter: we recommend bringing coats, pullovers and sweaters. 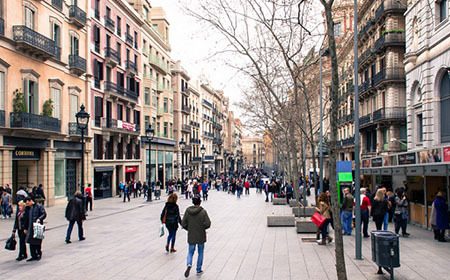 If you are thinking of coming to Barcelona in the winter, do keep in mind some preventive measures to build up your defences and prevent bad colds: watch what you eat, make sure your feet are warm and avoid abrupt changes of temperature. Spain, like several other EU countries, uses the euro. There are eight different coins: 1, 2, 5, 10,20 and 50 cents; and 1 and 2 euros. There are seven different banknotes: 5, 10, 20, 50, 100, 200 and 500 euros. The most usual opening hours are from Monday to Saturday from 10:00 a.m. to 2:00 p.m. and from 5:00 p.m. to 8:00 p.m. The big commercial centres are open continuously from 10:00 a.m. to 9:00 or 10:00 p.m.
Bear in mind that most businesses are not open on Sundays or public holidays. Some restaurants and leisure centres do keep regular hours. However, but we would advise you to check the opening hours for that business in advance. Chemists tend to be open from 9:30 a.m. to 1:30 p.m. and from 4:30 to 8:00 p.m. In big cities some are open 24/7. in Spain the clocks change for the summer and winter. The last weekend in October the clocks go back one hour (3:00 a.m. on Sunday becomes 2:00 a.m.) and the last weekend in March they go forward (2:00 a.m. on Sunday becomes 3:00 a.m.). The electricity supply in all of Spain and most of Europe is 220 volts and the plugs have two pins. The United Kingdom and Ireland use 240 volts and 3-pin plugs. So that you don’t have any problems with your electrical equipment, make sure you buy an adaptor or transformer in Spain to raise or lower the voltage; they cost approximately €8. Depending on the area, the water in Barcelona, does not have a pleasant taste. For this reason, it is advisable to drink bottled water, which is available from any supermarket. Yes. 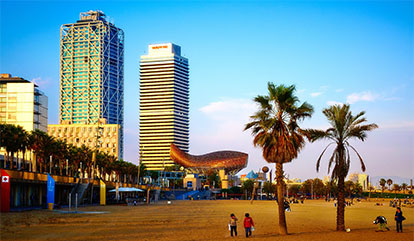 There is a free network with over 400 connection points all over Barcelona called “Barcelona Wi-Fi”. Your family and friends can phone you from overseas by dialling +34, the country code for Spain, and the 9-digit telephone number. Simply dial the 9-digit number, with no prefix, whether you are phoning from a mobile phone or landline.